US Open furore as umpire tells Kyrgios: "I want to help you"
The US Open was at the centre of an embarrassing impartiality row on Thursday when an umpire climbed out of his chair to tell controversial Nick Kyrgios: "I want to help you". "He was just concerned with the way I was playing," said Kyrgios after the match which he won 4-6, 7-6 (8/6), 6-3, 6-0, pocketing 19 of the last 25 games following Lahyani's intervention. However, Herbert blasted Lahyani, insisting the Swedish official had over-stepped the mark and he intended to confront him. Tournament referee Brian Earley then added a bizarre twist by claiming that Lahyani had only come down from his chair as the noise from the crowd made it impossible for him to communicate with the Australian. Lahyani stunned the crowd when he stood over the seated Kyrgios, berating the 23-year-old in the second set for the Australian's perceived lack of effort. At 2-5 down in the second set, Kyrgios spent the changeover slumped in his chair with his arms behind his head, biting on a towel and fidgeting with his eyebrows as the second round clash appeared to be slipping away from him. In his post-match news conference, Kyrgios attempted to play down the incident. "He said he liked me. I'm not sure if that was encouragement," said the Australian. "He just said that it's not a good look. I know what I was doing out there wasn't good. I wasn't really listening to him, but I knew it wasn't a good look." Kyrgios said he would be disappointed if Lahyani was sanctioned by the tournament for his impromptu chat. But Herbert insisted that Lahyani had over-stepped his responsibilities. "The umpire doesn't have to talk to him at all. The only thing he can tell him is pay attention, because if you continue like this, I'm going to give you a warning, something like this. While insisting that he wasn't sure if Lahyani's cosy chat had changed the outcome of the match, Herbert added: "I think he cares for Nick. He cares for the show also because people were going after the first set. "Everybody was there for the start. When they saw Nick in a bad mood, I would say, for the first two sets, they started going away." US Open chiefs insisted that there was nothing sinister in Lahyani's actions. "Lahyani was concerned that Kyrgios might need medical attention. 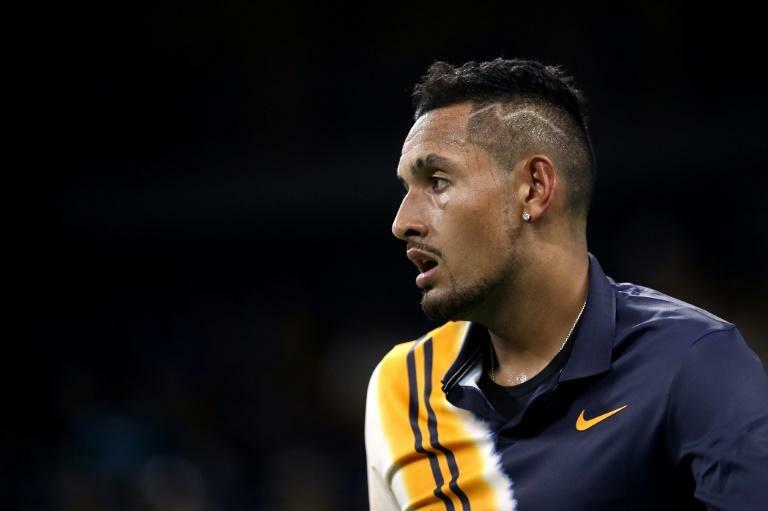 Lahyani told Kyrgios that if he was feeling ill, that the tournament could provide medical help," said Earley. Richard Ings, a former umpires chief on the ATP, said Lahyani's move was unprecedented. "I am racking my brain to think of a situation requiring a chair umpire to speak like that to one player," Ings tweeted. "I umpired thousands of matches I was ATP head of officiating I can’t think of one." Croatia player Donna Vekic added: "Didn’t know umpires were allowed to give pep talks." Kyrgios has had a chequered history in the sport, picking up a series of fines and sanctions for his on-court behaviour. At Wimbledon in 2015, he was accused of 'tanking' against Richard Gasquet. At the 2016 Shanghai Masters, he was fined and banned for eight weeks for "lack of best efforts" against Mischa Zverev. On his way to a 6–3, 6–1 loss in just 48 minutes in that contest, he was heard to ask the umpire: "Can you call time so I can finish this match and go home?" Kyrgios will face five-time champion and second seed Roger Federer for a last-16 spot.